Introduction – Dambal is located in Gadag district. The village would have acquired quite a respectable reputation as evident from the inscriptions found in its vicinity. It is one among very few places where we find a society patronizing all three major faiths, Hindu, Buddhists and Jaina, prevalent during the early and medieval period. The village has been referred as Dharmavolal and Dharmapura in inscriptions. The earliest inscription found, dated 1059 CE, was from the reign of the Western Chalukya king Someshvara I and mentions a grant to a Jaina shrine. Someshvara I patronized Shridharacharya who wrote a Jaina purana, Chandraprabhacharite. Few Buddhist inscriptions are also found here. 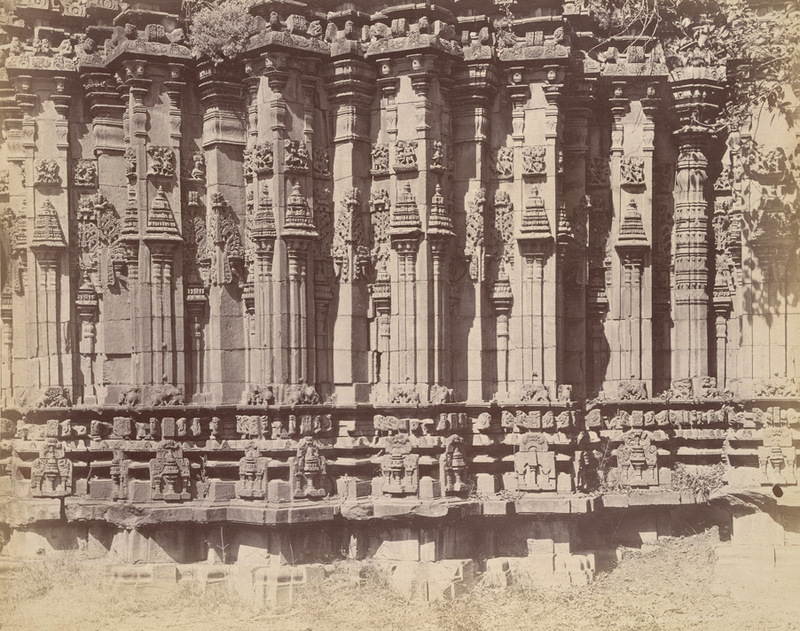 As per an inscription, during the reign of the Western Chalukya king Vikramaditya VI two Buddhist monasteries were constructed by the merchant communities of Lakkundi and Dambal at Dambal. From inscriptions, it can be said that these were in operation till thirteenth century CE. From above statements, it is evident that Dharmapura lived to its name during those bygone eras, patronizing and providing space for all major religions to co-exist and grow simultaneously. However, with the down fall of Buddhism in India and contraction of Jainas to few regions, Dambal also became predominantly Hindu. After the end of thirteenth century, we do not find any reference to its Buddhist monasteries and Jaina temples. The Buddhist monasteries are not traceable, and the Jaina temple is almost lost except few ruins. Monuments – There are few tourist attractions in Dambal. 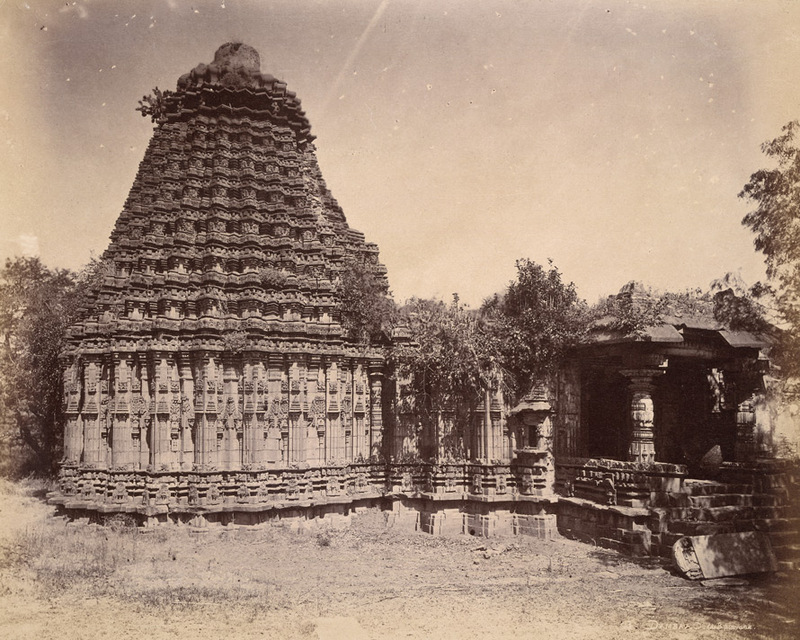 The two temples, of Dodda-Basappa and Someshvara, are located opposite to each other. There is a ruined fort where ruins of old Jaina temple can be seen. There are no ruins of the Buddhist monasteries mentioned in the inscriptions. Dodda-Basappa Temple – This famous and celebrated temple is a very singular Chalukya creation, mostly attributed to its shape and style. The temple faces east and consists of a garbha-grha (sanctum), sukanasi (vestibule) and a mandapa (hall). The hall is provided with two entrances, one on the east and another on the south. 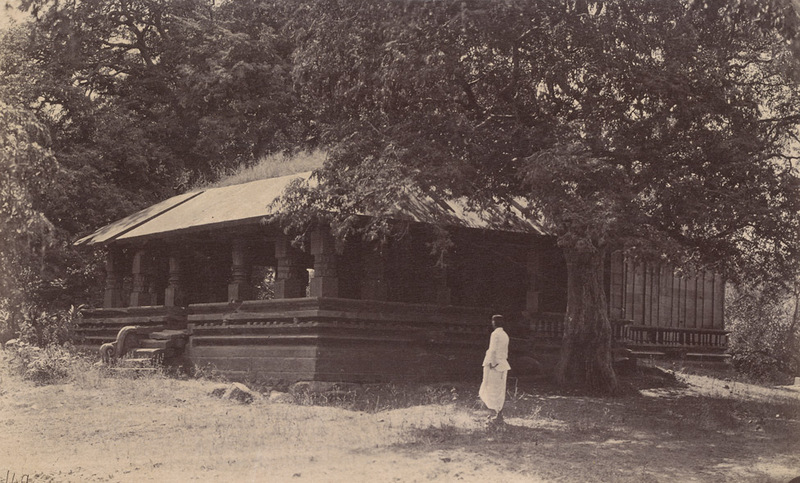 Both the entrances are provided with porches where the eastern porch has been converted into a hall to house a Nandi. Cousens2 explains the stellar plan of this temple as, “This is obtained by revolving a square about its center, its angles stopping at points equidistant from one another, the angles and re-entrants angles thus formed, being the perimeter of the plan. The shrine is planned on twenty-four salient angles, and the hall on thirty-two, but the continuity of these is broken where the shrine joins the hall and where the porches come.” Foekema explains that to produce a 24-pointed star, a rectangular corner must be divided into six equal parts. And this makes this vimana singular, as in Indian architecture, a stellar design is nearly always based on dividing a rectangular corner two or more times, thus providing 8-point, 16-point or 32-point stars. The stellar plan is continued with the shikhara which is comprises of seven stories. The first story is complete and follows the base pattern of the vimana however the above stories fail to follow the full pattern. It would be fair to say that it was the Hoysalas who made stellar plans famous however it was not there invention as we have many older temples depicting the stellar plans. The mandapa doorway on the east is elaborately carved. It has seven shakhas, running from the base to lintel and back to the base on the other side, thus covering three sides of the doorway. Gajalakshmi is present on the lalatabimba of the lintel. She is accompanied with four elephants, instead of the usual two. There is a torana (architrave) before the garbha-griha entrance. Few Chalukyan temples depict this feature of placing a torana in front of the sanctum/antarala. Images inside the torana are missing however looking at the festoons and loops, it would be proper to state that it was meant to place the Hindu Trinity. In the Western Chalukya temples, usage of miniature shrines as the decorative device over the temple vimana was in vogue. In this temple also we see many miniature shrines on the temple walls and adhishthana. These shrines provide us very important information about the prevalent temple architecture styles of that time. In this temple we find these miniature temples in Dravidian and Nagara styles. There is no foundation inscription, the earliest inscription found is dated in 1148 CE and referred the lord as Malabeshvara. This inscriptions is from the reign of the Western Chalukya king Someshvara IV. It might be said that the temple would have been constructed during the 1100-1150 CE. 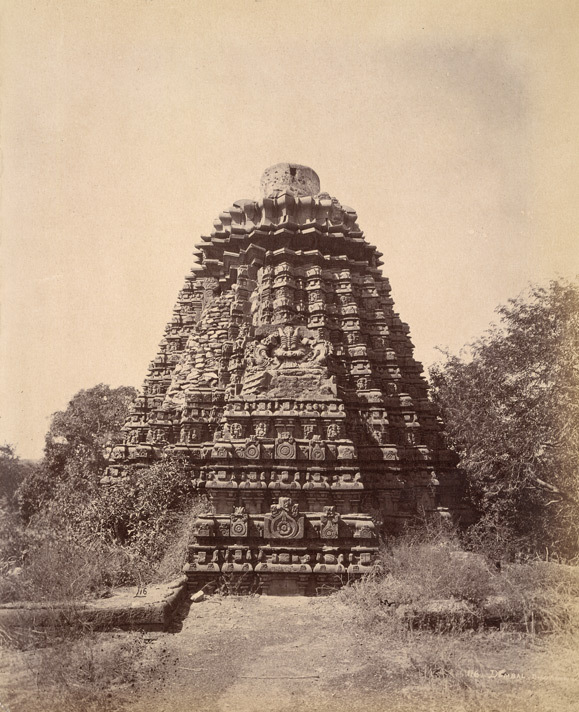 Someshvara or Dabgadi Temple – Referred as Someshvara Temple by Cousens and Dharmeshvara Temple by Foekema. the latter claims to derive this name from the AIIS photo-archives. This temple lies very close to the Dodda-Basappa Temple. It is a Hindu temple and faces east. The temple consists of a garbha-grha (sanctum), sukanasi (vestibule) and a gudha-mandapa (open hall). The hall here is rectangular instead of a square found very common. The hall can divided as five bays wide and four bays deep. The external bays on three sides are covered with a sloping roof, the rest of the nine bays have a flat roof above. The vimana is very simple, devoid of any decoration on external walls. No traces of shikhara are found thus suggesting it was flat roofed temple. The hall is provided with three entrances, on each on the east, north and south. Inside the hall, the central roof is supported on four pillars. There are additional 24 pillars, 12 full length and 12 half-length. The half-length pillars are supported on the parapet wall. Antarala doorway has pierced stone jail at the doorjambs, the feature mostly seen in the Chalukyan temples. An inscription found in the temple refers the god here as Madhavesvara. Fort and Temples – Dharwad district gazetteer talks about a stone rubble fort and a Jaina temple inside that fort. However at the time of that gazetteer, both these structures were in almost complete ruins. The gazetteer mentions that these were existing in 1842 however at present these are completely destroyed. On a slab fixed over a gutter near the old chavadi – South Indian Inscriptions, vol XI, no 94 – language Kannada – dated Saka 981 (1059 CE) – This inscription refers to the reign of the Western Chalukya king Trailokyamalladeva (Somesvara I). It registers a gift of gold made to the nagara-Jinalaya at Dharmavolal by Birayya-Setti, the son-in-law of Bachyya-Settin in the presence of the Mahanagara of the Sixteen Settis. On a slab fixed over a gutter near the old chavadi – South Indian Inscriptions, vol XI, no 104 – This damaged inscription refers itself to the reign of Western Chalukya king Trailokyamalladeva (Someshvara I) who, on palaeographic grounds of the record must be Somesvara I and gives the prasasti of his subordinate (name lost)’who possessed the five great sounds’. On a stone tablet to the left of the Jain shrine in the fort – Dharwad Gazetteer – dated in the nineteenth regnal year of the Western Chalukya king Vikramaditya VI, which corresponds to 1095 CE – At the top of the stone are several emblems. In the centre is a figure of a woman, apparently the Buddhist goddess Tara or Taradevi who is mentioned in the inscription. She is seated in a shrine facing full front, and holds in her left hand an opening water-lily, and in her right hand some other object. To her right is a cow and calf with the sun above them; and to her left is the standing figure of a man with his hands joined and held to his face in the act of salutation. In front of his hands is the flower of an eight-leaved water-lily, behind him are two lamp-stands with burning flames, and above him is the moon. The inscription begins with a salutation to Buddha and Tara. It records that on Sunday the fifth day of the bright half of Magha or February-March in the nineteenth year of the reign of the Western Chalukya king Vikramaditya VI , grants were made to two Buddhist monasteries or viharas at Dambala. One of the monasteries is mentioned to be built in honor of Buddha, by the sixteen settis (head-merchants) of Dambala, and the other as having been built in honor of the Buddhist goddess Tara by the merchant Samgavayya of Lokkigundi, the modern Lakkundi. The head merchants who built and endowed the monasteries are said to be of the Vira Balanja sect, the class of merchants or traders who afterwards became the chief supporters of the Lingayata religion. The inscription mentions Lakshmadevi, the chief queen, as governing the district called the eighteen agraharas and the city of Dharmapura or Dharmavolal, apparently Dambala. On the wall to the left of entrance into the Jaina temple – South Indian Inscriptions, vol XI, no 144 – dated in Chalukya-Vikrama year 23, which corresponds to 1098 CE – The inscription belongs to the reign of Tribhuvanamalladeva (Vikramaditya VI) and records the gift of oil made by the fifty families of oilmen (Telligar) for a perpetual lamp in the Buddha-vihara built by Sangava-Setti. On the back of the image of the god Maruti in the Maruti temple – South Indian Inscriptions, vol XI, no 175 – dated in Chalukya-Vikrama year 49, which corresponds to 1125 CE – This inscription belongs to the reign of Tribhuvanamalladeva (Vikramaditya VI) and introduces his subordinate Permadbhupa as the governor of Masavadi-nadu. It states that certain Ajjaya, Nayaka, son of Rebbarasa and Bavikabbe, constructeu a temple of Siva at Dharmavolal to which Mahamandalesvara Hermmadiyarasa granted land after purchase from the Sixteen Settis and the Nagaras of Dharmavolal. Mention is made of Nirvanasakti-Panditadeva and of his disciple whose name is lost. On a slab set up in front of the Doddabasappa temple – South Indian Inscriptions, vol XV, no 57 – dated in Saka 1106 (1184 CE) – The inscription refers to the reign of the Western Chalukya king Somesvara IV and records the gift of income derived from the panaya tax on all the gardens excepting those endowed as sarvamanya to the deity Mailabesvara, made in the presence of the god Svayambhu at Dharmapura by Mahapradhana, Senadhipati, Dandanayaka Tejimayya and his subordinates Bakana-dandanayaka and Revarasa, for dredging and repairds in stone and wood to the sluice of the local tank called Gonadredging and repairs in stone and wood to the sluice of the local tank called Gona-samudra. The gift was entrusted to the sixteen Sethis of the village, who also made gifts of land to the same tank, in conjunction with the nakharas. Dharmapura, also mentioned as Dharmavolal, was situated in Masavadi division. The record which contains a few Sanskirt verses also, was composed by poet Nagadeva Bhatta, son of Bammarasa. On the wall at the left entrance into the Jaina temple – South Indian Inscriptions, vol XV, no 199 – dated in the 14th regnal year of the Yadava king Ramchandra which corresponds to 1283 CE – It mentions the Acharya of Bhogadeva. The inscription is damaged and the details are lost. On a stone built into the platform of the mandapa of the temple called Dabbagudi – South Indian Inscriptions, vol XV, no 569 – assigned to 12th century CE – It refers to the gadimba of the land belonging to the god Madhavesvara. On a pillar at the left of entrance into the Kalamesvara temple – South Indian Inscriptions, vol XV, no 570 – assigned to 12th century CE – It describes Masavadi-nadu which is stated to have been situated on the northern bank of the river Dakshina-Ganga (i.e., Tungabhadra), in Kuntala-vishaya. It then states that Pemadi secured from his overlord the ruler-ship of Masavadi, by dint of his valor. Permadi had two sons Harihara and Kuppa and the latter was the father of Harihara and Mallideva. The records is mutilated and incomplete. On a slab set up near a well in Survey No. 413 – South Indian Inscriptions, vol XV, no 571 – assigned to 12th century CE – It enjoins that no talara should take any produce of the garden, evidently referring to the field bearing the inscription originally. How to Reach – Dambal is located in Gadag district of Karnataka and situated about 23 km from Gadag town. It is located on SH 45, Gadag-Mundargi road. Gadag is the nearest town, railway station. 2 Cousens, Henry (1926). The Chalukyan Architecture of the Kanarese Districts. Archaeological Survey of India. New Delhi. Burgess, James (1885). List of Antiquarian Remains in the Bombay Presidency. Government Central Press. Mumbai. Hiremath, Vishwanath R (2007). Chalukyas of Kalyana. Agam Kala Prakashan. New Delhi. ISBN 8173200696. Kamiya, Takeo (1996). Architecture of Indian Subcontinent. Om Books. ISBN 9784887061415. Palande, M R (1959). Dharwad District Gazetteer. Karnataka Government. Dharwad.